Sander May and Tom Noah, Respectively born on 27 June 1985 and 4 September 1985, met during a techno party in the LVC, Leiden in 2003. They were both just started DJ'ing and were discussing their love and passion for music as well as their growing need to organize their own events in their hometown. Today, Sander and Tom are the proud promoters of KLIKK Music which organizes indoor and outdoor events as well as hosting a monthly radio show. 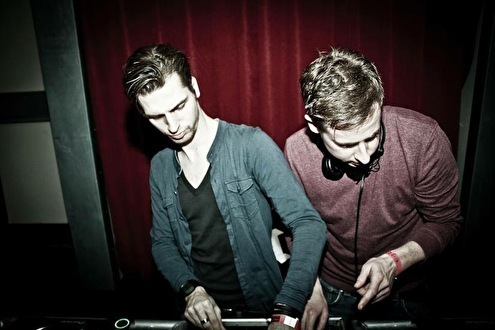 As a dj-duo, Sander and Tom have played all over The Netherlands and are setting their first production steps which will see the light of day by the end of this year (2011). In 2004 Sander started the concept 'Complexed". He asked Tom to join in 2005 when things really started to evolve. Together they build 'Complexed" into a successful event where they were DJ'ing as residents. Soon they conquered the Leiden area with their deep and funky DJ-sets and got noticed by other promoters. Their journey through numerous events throughout the country saw them performing together at places like; Doornroosje, Tivoli, Studio 80, Patronaat, Gelredome, Simplon, Woodstock, Hotel Arena, Whoosah, Off-Corso and Catwalk. Because of the success of 'Complexed", it was time for Sander and Tom to start a new concept in the bigger LVC under the name 'This is Complexed". At the same time they started doing festival events in the Leiden city centre during the yearly Queensday and Leiden's Ontzet dates under the name KLIKK. Nowadays, all of their events are under the KLIKK flag and has seen many national and international artists performing alongside Sander and Tom. These include; Ben Sims, Marco Bailey, Steve Rachmad, Andre Galluzzi, Joel Mull, Heiko Laux, Speedy J, Joris Voorn, The Advent, Valentino Kanzyani, Technasia, James Ruskin, Jerome, Bart Skils, Shinedoe, Dave Ellesmere, Secret Cinema, Estroe, Luke Slater, Lauhaus, David Labeij, Miss Djax, Luna City Express, Jason & The Argonauts, Wouter de Moor, Kabale Und Liebe and many more.. Meanwhile, the duo found their way into the studio working on their production skills for over more than two years. Their first productions are soon to be expected… Stay tuned!